Claude Monet also known as Oscar-Claude Monet or Claude Oscar Monet ( November 14, 1840 – December 5, 1926) was a French Impressionist painter. 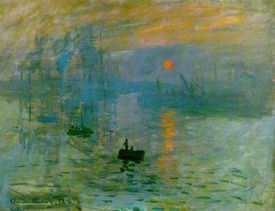 The term Impressionism is derived from the title of his painting Impression, Sunrise. Monet was born to Adolphe and Louise-Justine Monet, both of them second-generation Parisians, of 90 Rue Laffitte, in the 9th arrondissement of Paris, but his family moved in 1845 to Le Havre in Normandy when he was five. He was christened as Oscar-Claude at the church of Notre-Dame-de-Lorette. His father wanted him to go into the family (grocery store) business, but Claude Monet wanted to become an artist. His mother was a singer. On the first of April 1851 Monet entered the Le Havre secondary school. He first became known locally for his charcoal caricatures, which he would sell for ten to twenty francs. Monet also undertook his first drawing lessons from Jacques-Francois Ochard, a former student of Jacques-Louis David (1748 - 1825). On the beaches of Normandy in about 1856/1857, he met fellow artist Eugène Boudin, who became his mentor and taught him to use oil paints. Boudin taught Monet en plein air (outdoor) techniques for painting. On 28 January, 1857 his mother died. Now 16 years old, he left school and his widowed, childless aunt Marie-Jeanne took him into her home. When Monet travelled to Paris to visit The Louvre, he witnessed painters copying from the old masters. Monet, having brought his paints and other tools with him, would instead go and sit by a window and paint what he saw. 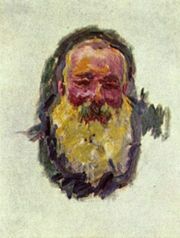 Monet was in Paris for several years and met several friends who were painters. They all painted in the impressionism style. One of those friends was Édouard Manet. In June of 1861 Monet joined the First Regiment of African Light Cavalry in Algeria for two years of a seven-year commitment, but upon his contracting typhoid his aunt Madame Lecadre intervened to get him out of the army if he agreed to complete an art course at a university. It is possible that the Dutch painter Johan Barthold Jongkind, whom Monet knew, may have prompted his aunt on this matter. Disillusioned with the traditional art taught at universities, in 1862 Monet was a student of Charles Gleyre in Paris, where he met Pierre-Auguste Renoir, Frederic Bazille, and Alfred Sisley. Together they shared new approaches to art, painting the effects of light en plein air with broken colour and rapid brushstrokes, in what later came to be known as Impressionism. Monet's 1866 Camille or The Woman in the Green Dress (La Femme à la Robe Verte), which brought him recognition, was one of many works featuring his future wife, Camille Doncieux. Shortly thereafter Doncieux became pregnant and bore their first child, Jean. In 1868, Monet attempted suicide by throwing himself into the Seine. During the Franco-Prussian War ( 1870– 1871), Monet took refuge in England to avoid the conflict. While there he studied the works of John Constable and Joseph Mallord William Turner, both of whose landscapes would serve to inspire Monet's innovations in the study of colour. From 1871 to 1878 Monet lived at Argenteuil, a village on the Seine near Paris, and here were painted some of his best known works. Impression, Sunrise (Impression, soleil levant) ( 1872/ 1873). Upon returning to France, in 1872 (or 1873) he painted Impression, Sunrise (Impression: soleil levant) depicting a Le Havre landscape. It hung in the first Impressionist exhibition in 1874 and is now displayed in the Musée Marmottan-Monet, Paris. From the painting's title, art critic Louis Leroy coined the term "Impressionism", which he intended to be derogatory. In 1870, Monet and Doncieux married and in 1873 moved into a house in Argenteuil near the Seine River. They had another son, Michel, on March 17, 1878. Madame Monet died of tuberculosis in 1879. Alice Hoschedé decided to help Monet by bringing up his two children together with her own. They lived in Poissy. In April 1883 they moved to a house in Giverny, Eure, in Haute-Normandie, where he planted a large garden which he painted for the rest of his life. Monet and Alice Hoschedé married in 1892. In the 1880s and 1890s, Monet began "series" painting: paintings of one subject in varying light and weather conditions. His first series was of Rouen Cathedral from different points of view and at different times of the day. Twenty views of the cathedral were exhibited at the Durand-Ruel in 1895. He also painted a series of paintings of haystacks at different times of day. 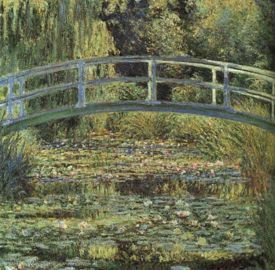 Monet was exceptionally fond of painting controlled nature: his own garden in Giverny, with its water lilies, pond, and bridge. He also painted up and down the banks of the Seine. Between 1883 and 1908, Monet traveled to the Mediterranean, where he painted landmarks, landscapes, and seascapes, such as Bordighera. He painted an important series of paintings in Venice, Italy, and in London he painted two important series - views of Parliament and views of Charing Cross Bridge. His wife Alice died in 1911 and his son Jean died in 1914. During World War I Monet painted a series of Weeping Willow trees as homage to the French fallen soldiers. Cataracts formed on Monet's eyes, for which he underwent two surgeries in 1923. It is interesting to note that the paintings done while the cataracts affected his vision have a general reddish tone, which is characteristic of the vision of cataract victims. It may also be that after surgery he was able to see certain ultraviolet wavelengths of light that are normally excluded by the lens of the eye ; this may have had an effect on the colors he perceived. After his operations he even repainted some of these paintings. 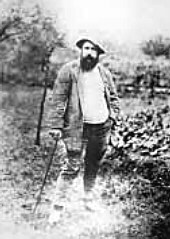 Monet died December 5, 1926 at the age of 86 and is buried in the Giverny church cemetery. His famous home and garden with its waterlily pond and bridge at Giverny are a popular drawcard for tourists. In the house there are many examples of Japanese woodcut prints on the walls. In 2004, London, the Parliament, Effects of Sun in the Fog (Le Parlement, Effet de Brouillard) ( 1904), sold for over U.S. $20 million. Interestingly, in 2006, the journal Proceedings of the Royal Society A published a paper providing evidence that these were painted in situ at St Thomas' Hospital over the river Thames.